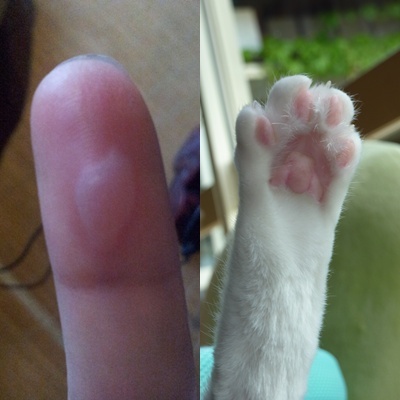 呀! 我的天呀! 我快要哭拉! 今天是我在杜之樹作 helper 的最後一天! 千萬個不捨得! 不捨得這裡的一切，一草一樹每個角落都滿載Masa-san 的心思，懷念跟他相處的日子。真的要感謝他讓我這個零日文的港女在這裡當helper. 這星期將會是我人生美麗的一頁. Ah! I wanna cry!!!!!!!!!!!!!!!! It is my last helper day in MorinoKi. I will gonna miss it. Definitely I will miss Masa-san, MoMo, Hug and MorinoKi. It is one of the beautiful page in my life. I am so glad that Masa-san let me be part of this project provided that I cannot speak Japanese and work clumsy. Last but not least, I dedicated this word art to Morinoki, this is first time in my life to do this. 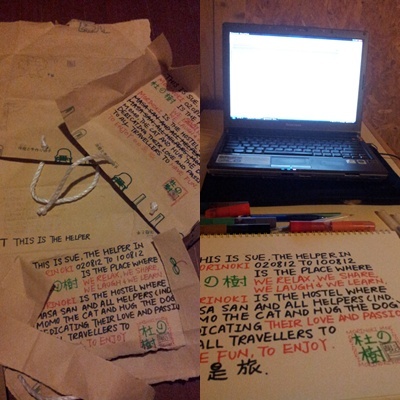 Thanks the souvenir shop provide me such a lot of shopping bags to do the drafting. Masa-san can no longer eat fresh plum after he turned 30. I can no longer take alcohol after 30. We got allergy respectively. Sometimes we just can't take something (no matter we like or not) anymore out of sudden. I believe we just used up the quota of it. I miss the nights, hang out with friends in bars, we drink, we smoke, we swear, we say silly things. It is kind of enjoyment which I classified as "too good to be true". After I got the drinking allergy, I realize everything has its limit, has its quota. We just have to stop it when the limit comes. It leads me hesitate to have the things which is too good to be true because I am afraid of losing it and I hate the feeling of missing something forever. BUT today I have new understanding after Masa-san give me this. This is Black beer BUT alcohol free. HAHA! 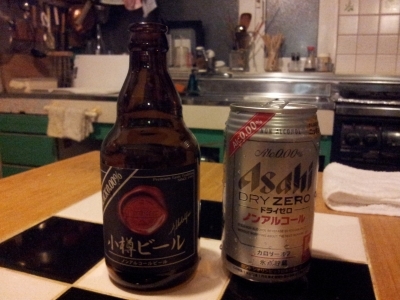 Thanks Masa-san for this beer. Thanks Otaru for this amazing things! My drinking days can be back. YEAH!!!!!!!!!!!! Although I cannot drink alcohol, I can still drink beer. There are always options. Right! My alcohol day is over however my drinking days are now begin. I will no longer afraid of having too good to be true because it does happen if we keep explore the options. Although I have not join Masa-san beer party tonight, I have a good time staying in Morinoki. I have chit chat with Taiwanese, tea with British, whoof sharing with Malaysian, itinerary discussion with Hong Kong people and drunk talk with Japanese. Isn't it great! Thanks MorinoKi for all that. It's just too good to be true. Thanks Lisa make me this dinner. 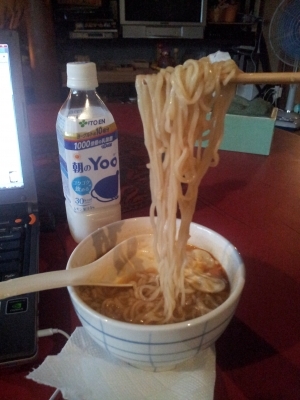 It's causal, It' too salty BUT I FEEL WARM. I feel home. Today Masa-san told me his travel story before he started Morinoki. I am so proud of him. 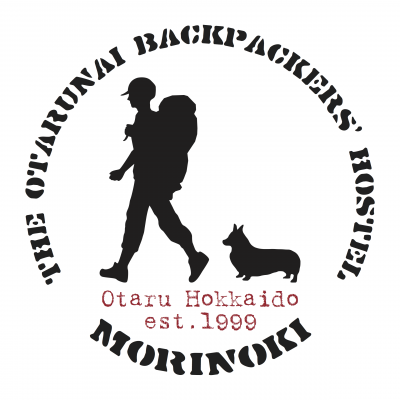 To take care MorinoKi, he is not likely to have long journey but I think he is now continue his journey by helping other travellers to have theirs. I grow up from a very traditional Chinese family which my mum always told me that not to talk to stranger, not to get freebie from stranger. However starting from this trip, I have different thought. We have to be nice to everyone and pass the helping heart on. Haha! Am I talking like John Lennon? In this hostel, we make friends regardless of their background, colors, religious... we interact and share, we enjoy we are different and learn from each others. 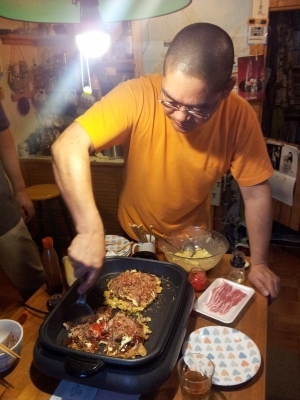 Okonomiyaki of the night, Thanks masa-san. 農場WWOOF 之後是拔草成癮症, 不知是次杜之樹的幫工生活之後又會為我養成什麼的新習慣呢? 是掃石級，寫BLOG, 執床舖, 多語言溝通 (昨晚一輪中國，日本，台灣及星加坡的交流令我大開眼界不亦樂乎) 或是什麼呢? 拭目以待! 昨晚的一場環亞交流真令我一再回味，我們的話題大江南北，電視節目方面有"非誠勿擾"(中國的)到 "康熙來了" (台灣的), 食物方面由"成吉思汗" (日本烤羊) 到"麻婆豆腐" (日本的中華料理)，語言方面有"awesome" (美) 到 " 很牛" (中) 再去 " SUGOI" (日). 真多謝各位國語及英語的翻譯好讓我這不諳日文的港女也可以樂在其中. 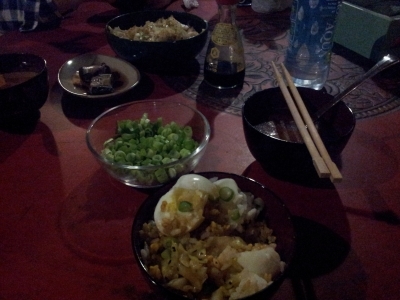 There are whole room of Asians in the dinning room, came from Taiwan, Shanghai, Singapore and Tokyo. Sue can't wait to join their conversation. Sue will write more tomorrow. O! Andry wake up from the bed I made this morning. Hope he has a nice sleep in the bed I made. It brings me satisfaction like the first transaction is done in a new job. I was plan to go picnic next to the temple, I was plan to go the shopping mall.....etc. I have too many plans but plan is plan, none of these has happened today. The picnic plan is gone, as I am so hungry to walk to the temple. The shopping plan is gone as I am so sleepy after lunch. I took a 4 hours nap, 2-6pm. Lazy Sue has a relax day. Awesome! 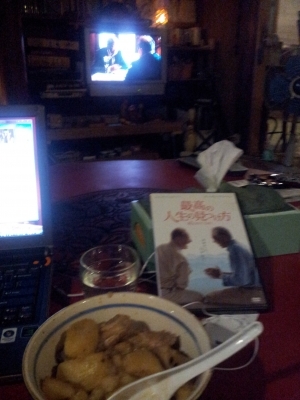 The dinner I cooked tonight, potato chicken rice with the movie, buckle list as my side dish. Satisfied Sue reporting the above when she is planning to go 7-11 buy herself an ice-cream as desert to conclude the day. Hope this time she can make this happen. Following the friend reunion trip in Tokyo, I have continued my Hokkaido working holiday trip phase 2, starting in MorinoKi in Otaru. The journey on my own is now to begin. I am expecting a lot of first time is gonna be happen. I am expecting to see how I can sort things out in this foreign country which I am totally an illiterate. I can't read, I can't speak and I can't understand everything in Japanese. Everything is new to me, somehow it is a whole new world to me. It must gonna be fun. I am going to comprehend everything by my common sense, by imitating, by my passion of helping other travelers like me... etc. I am going to have wonder by wonder, I think it is what traveling means, to explore, to wonder, to understand oneself in a different world in a different way. Sue in MorinoKi dining room report.